Our wedding cakes have been featured at several reception sites in North Carolina. Here are some facilities located in Raleigh, Durham, Cary, and Chapel Hill along with other cities in Wake County that have hosted our wedding cakes. Ready to start talking about your wedding cake? Schedule a consultation and cake tasting at our Fuquay-Varina cake studio. Wedding cake prices are determined by the design as well as the number of servings you select. Each cake is customized special for you and may vary according to the complexity of details, intricacy, and flavor of the cake. A minimum charge of $450.00 is required for cakes regardless of the amount of guests. Additional charges may apply for fillings and special flavored cakes. 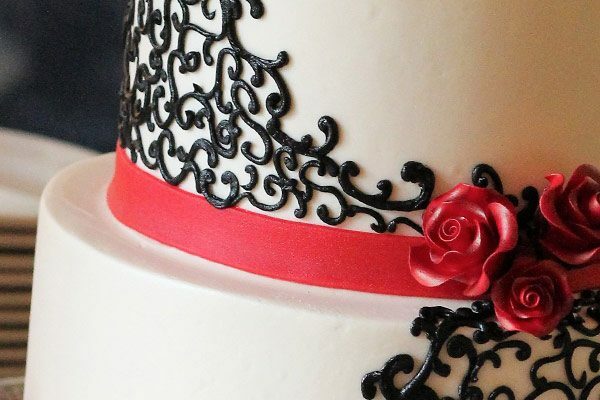 Additional charges apply for accessories such as gum paste flowers, embellishments, fondant ribbons, as well as other specialty items requested. Fresh flowers will need to be provided by your Florist. A 30% non-refundable deposit is required to reserve your date. Delivery fees are additional and are determined by the distance. Locations outside our normal delivery areas may have an additional charge as well.